Here is a list of various record holding lakes. Lake Titicaca, located on the border of Peru and Bolivia, is the world's highest navigable lake. Although it's name is misleading, the Caspian Sea is actually a very large lake with a surface area of 371,000 square km, making it the largest in the world. The endorheic basin is located between Asia and Europe. If Lake Michigan and Lake Huron are treated as a single lake, then the combined Lake Michigan-Huron is the largest freshwater lake in the world by surface area. The lake occupies an area of 117,400 square km. If the two lakes are treated separately, then Lake Superior is the largest freshwater lake by surface area in the world. The area of Lake Superior is 82,100 square km. Lake Baikal, a rift lake located in southern Siberia, is the world’s deepest lake. The maximum depth of the lake is 5,371 ft., and a mean depth of 2,457 ft. The origin of the lake explains its great depth, as Lake Baikal is a rift lake that was formed as a result of tectonic activity. The lake is even growing deeper due to the widening of the rift. The Caspian Sea is the largest lake by volume. The lake occupies an area of 78,200 cubic km. Lake Baikal is the world’s largest freshwater lake by volume. The lake has a volume of 5,521 cubic miles, and holds nearly 20% of the world’s freshwater resources. The volume of water held by Lake Baikal is equivalent to the sum of the volume of water contained within the five Great Lakes of North America. Lake Tanganyika, an African Great Lake, is the world’s longest lake. The lake has a length of about 660 km. It is also the world’s second oldest, second deepest (4,820 ft depth), and second most voluminous freshwater lake. With an estimated age of 25 million years, Lake Baikal is regarded as the world’s oldest lake. The rift lake was created as a result of tectonic movements in the Baikal Rift Zone. The crater lake atop the Ojos del Salado stratovolcano is regarded as the highest lake in the world. The volcano is located on the border between Chile and Argentina. 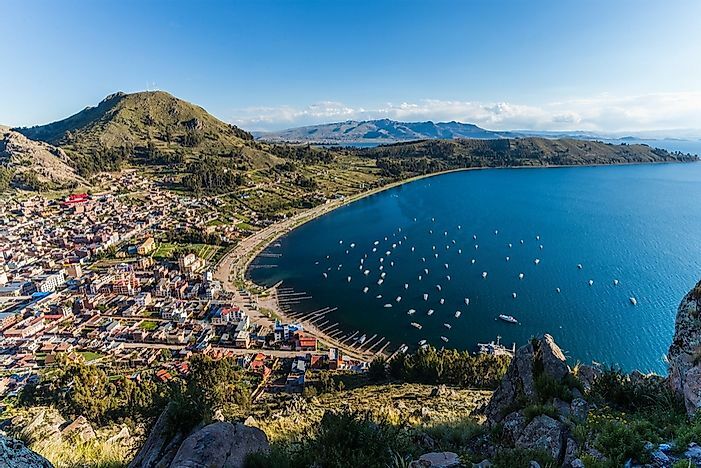 The crater lake is located at an elevation of 20,960 ft on the mountain’s eastern side, and has a diameter of about 330 ft.
Lake Titicaca is the highest commercially navigable lake in the world. It is located at an elevation of 12,507 ft in Peru and Bolivia, and also holds the record of being South America’s largest lake both by volume and surface area. The PeruRail-operated Manco Capac is the largest vessel afloat on the lake. The Dead Sea is the lowest sea in the world. It is located 1,371 ft below sea level. The Dead Sea borders Jordan and Israel. It is one of the saltiest bodies of water with a salinity level of 34.2%. If treated as a single lake, Lake Michigan–Huron is considered to have the longest lake coastline in the world. The lake has a coastline of 5,250 km if the coastlines of the lake’s islands are ignored. However, if the Lake Huron and Lake Michigan are treated separately, then Lake Huron alone would have the world’s longest coastline at 2,980 km. The Upper Dumbell Lake in Canada, located only 5.2 km away from Alert, the world’s northernmost settlement, is the northernmost named lake in the world. There are several lakes north of this lake, but none have been named. These unnamed lakes are mapped only in some highly detailed maps of the region. Manitoulin Island, located in Lake Huron, is the largest island that is located in a lake. The island occupies an area of 2,766 square km. Crater Lake, located on Vulcano Island, which is located in Lake Taal on the Philippine island of Luzon, holds the record in this category. Spanning an area of 5,542 square km, Nettilling Lake, located on the Baffin Island, is the largest lake located on an island. It is a cold freshwater lake that is crossed by the Arctic Circle. The largest freshwater lake that lacks an island is Lake Bernard, which is located in Ontario, Canada. The lake is also surprisingly not connected to any other lake, unlike the thousands of other lakes in the Canadian province. Lake Enriquillo is the world’s only saltwater lake to be infested with crocodiles. The hypersaline lake is located in the Dominican Republic, and houses the largest American crocodile population in the Caribbean region. What Is Biomagnification And How Is It Detrimental To Our Health? Is Bioremediation An Effective Way To Decontaminate Our Planet?